So, 2015 is here and I have as usual been musing about what I'd like the New Year to bring for me, what things in my life I'd like to change/improve on, and what goals - big or little - I'd like to achieve this year. The New Year always brings a kind of fug for me - Christmas (my favourite time of year) is over, the presents have been unwrapped and the chocolate eaten, suddenly the reality of the freezing cold January weather hits, with a long expanse of time ahead with no big plans made...I usually find this really hard, and feel a bit unsettled and anxious going into January, but this year I have planned some lovely things for Jan/Feb - ensuring I have loads to look forward to, keep me busy and giving me something solid to aim for. One of the things I want to concentrate on in 2015 is being kinder to myself - and the planning nice things in Jan/Feb is all part of that. Becoming a Mummy has been the most amazing thing in the world, and has changed me as a person, made me a better person, far less selfish - but sometimes you really do forget to look after yourself, and I can be really very hard on myself - I'm good at putting on the pressure - you MUST lose weight, you MUST do the housework, you MUST walk miles and miles and miles, you MUST cook an awesome dinner from scratch, you MUST blog until 2am, you MUST be the hostess etc etc, and it can all be a little bit, well...exhausting. This year I want to make an effort to regularly take the time to do things just for me, to be kind to myself without feeling guilty - whether that means a weekend 'off' with friends, a meal out with my bestest buddies, or simply just half an hour in the bath, or an hour curled up with my favourite book - I will do things just for me, for my own happiness and relaxation - under the guise that a happy mummy means a happy baby - and we all deserve some time out, right? I've started this in earnest this week with a whole hour of reading my new book ('Before I Go To Sleep' by S J Watson) on Friday while Bert had his nap, which was utter bliss - it was hard to just lie down on the bed and relax with my book at first, but I'd ensured I'd done all the housework jobs in the morning and told myself not to feel guilty at all. Settling down with a cuppa and a good book - I will do this far more often in 2015! On Saturday, my sister and I headed to the sales in Milton Keynes for the day to spend our Christmas money/vouchers - Liam and Bert had a Father/Son day and visited the farm, while Mummy and Jojo shopped til' we dropped! It was such a fun day, and rather a revelation for me - I was able to fit into every single size 12 item of clothing I tried on, and bought loads of lovely things - I was so chuffed!! It felt amazing to confidently walk into every shop knowing that something would fit me (after being a size 18/20 my whole life this is a very new experience). 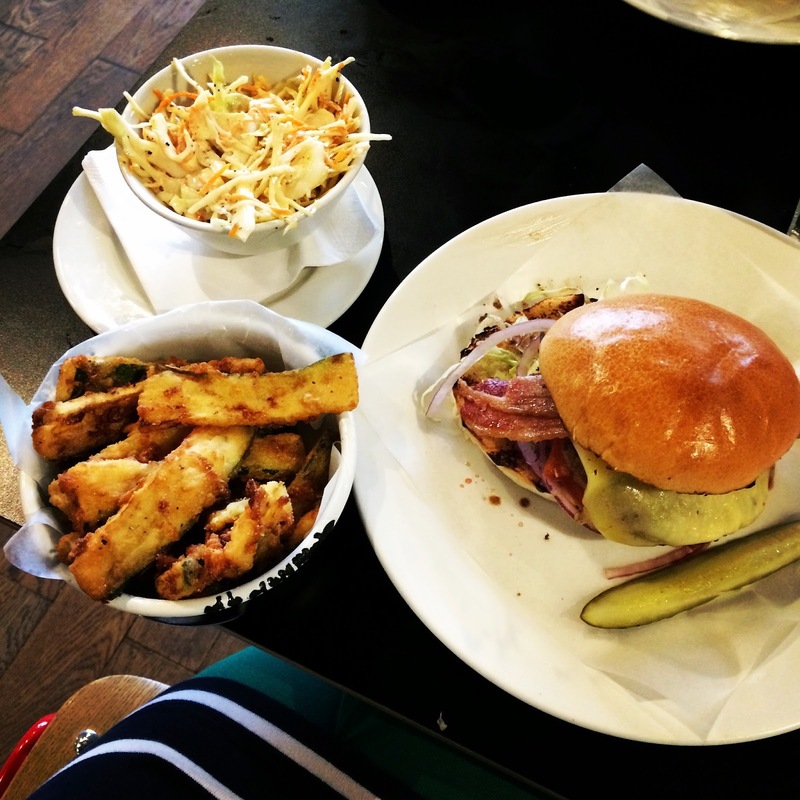 Jo and I had a really lovely girlie day, we had a yummy treat lunch out at Byron Hamburgers, and we didn't get home until gone 7pm with a whole car boot full of shopping bags! A very good start of being kind to myself. 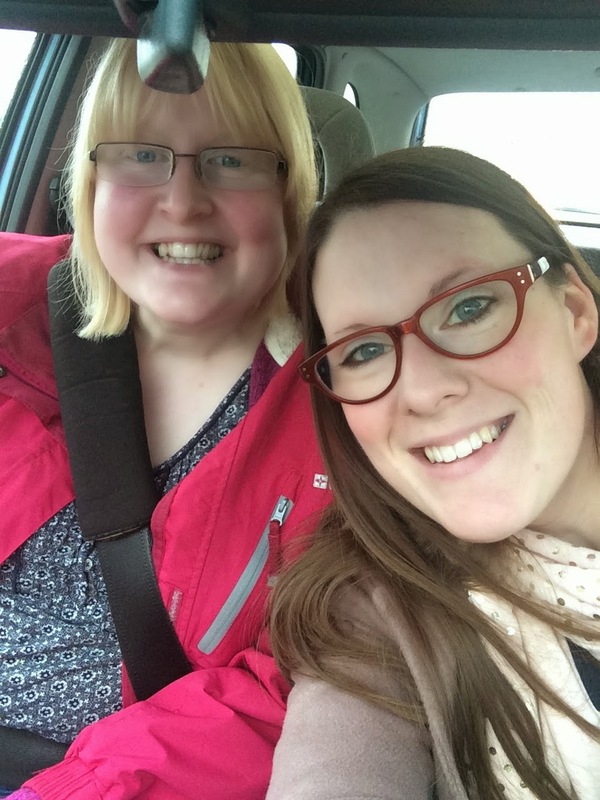 Me and my twin sister Jo being kind to ourselves on our girlie shopping trip on Saturday - car selfie! Amazing treat lunch at Byron Hamburgers with Jo on Saturday - final big treat before heading back to 1200 calorie a day limit so as to achieve 2015's weight loss goal. 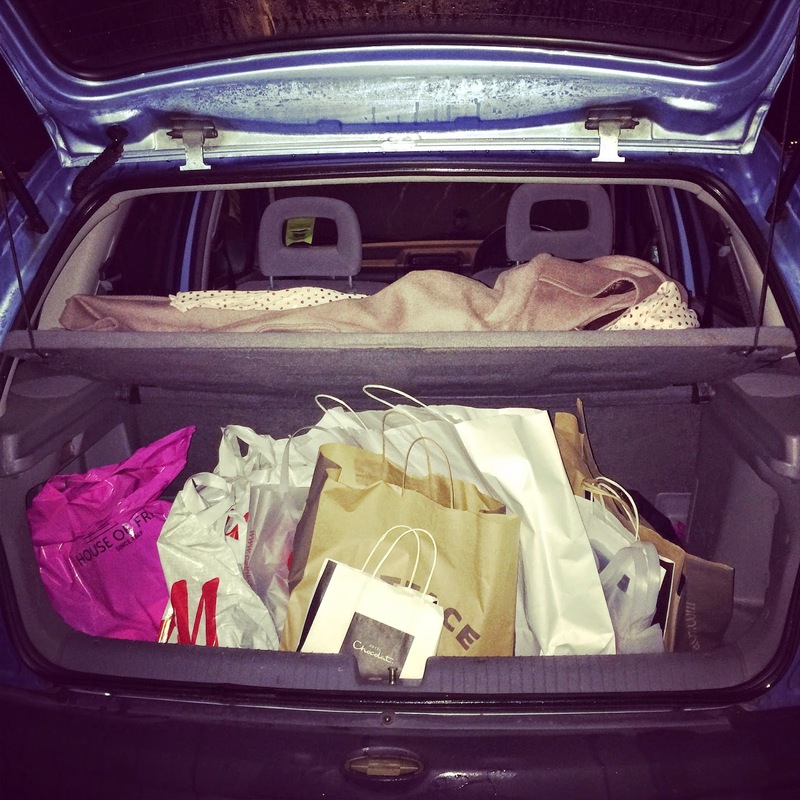 A car boot FULL of shopping - is there any better way to be kind to yourself? The theme of weight loss continues into 2015. I am absolutely thrilled with my achievements of 2013/14 and I still sometimes can't believe quite how far I've come. Dropping from a size 20 to a size 12, and shedding over 6 stone in weight has been such a brilliant journey for me. Originally my weight loss aim was to be a size 14, and 11 stone - but now that I've smashed that target I know I can take it further and believe I can achieve getting to 10 stone, and hopefully at that point being an absolutely confident size 12 in every shop, perhaps even on the small side of a 12! I plan to continue to use the My Fitness Pal App to calorie count through 2015 - and perhaps by my 2016 New Year post I will feel confident and educated enough to leave the app behind me? For this year through the plan is to head back to my 1200 calories per day limit until I hit my 10 stone target (I'm hoping I can achieve this by March time at the latest), then I will begin the 'maintain my current weight' journey - where I should be able to up my daily calories to around 1700 per day, which is much more 'do-able'. I know that the 1200 calories a day limit is quite tough, but I KNOW I can do it, I've done it before, and I feel amazing once I'm back into it again. Ive had 2 weeks of excess over Christmas, popped on a couple of Christmas pounds, and now it is time to concentrate on achieving my new target and ensuring I'm the healthiest and best version of myself for 2015. I'm excited! 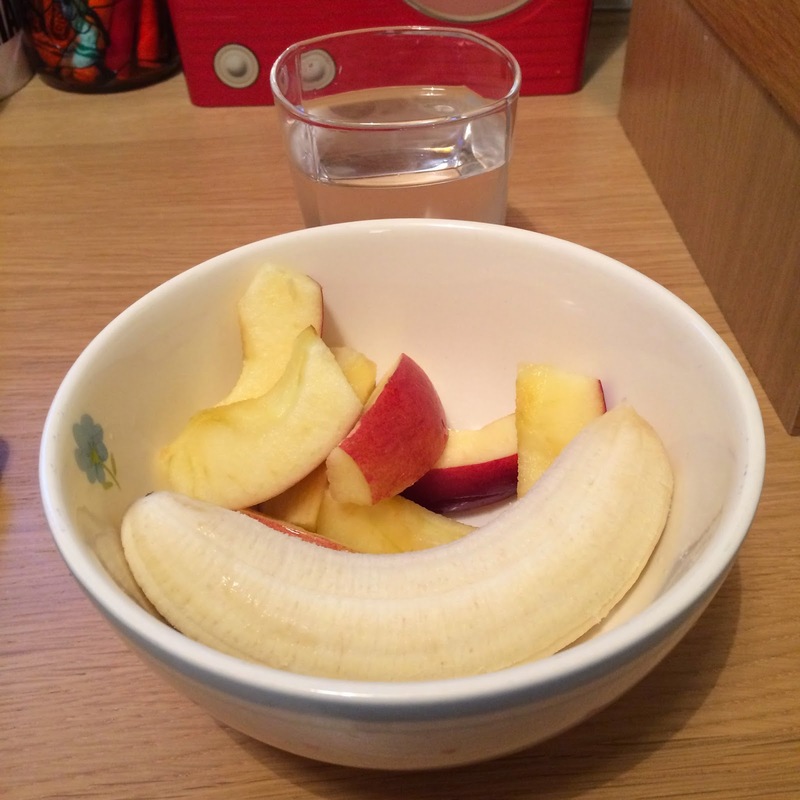 Healthy and low calorie breakfast to start my New Year pledge of getting to 10 stone. One of the things I definitely wasn't able to master in 2014 was staying hydrated - I definitely improved and got better at remembering to drink lots of water - but I'm still not drinking anywhere near enough, and I'm pretty sure I'm still confusing thirst for hunger. I know that staying hydrated is so important, and pretty convinced it will help no end with this last part of my weight loss journey - as well as improving my skin, hair, nails, mood etc - so I pledge to make a really huge effort to drink loads of water this year. I have my first glass of the day next to my laptop as I write, and I'm feeling fired up big time. 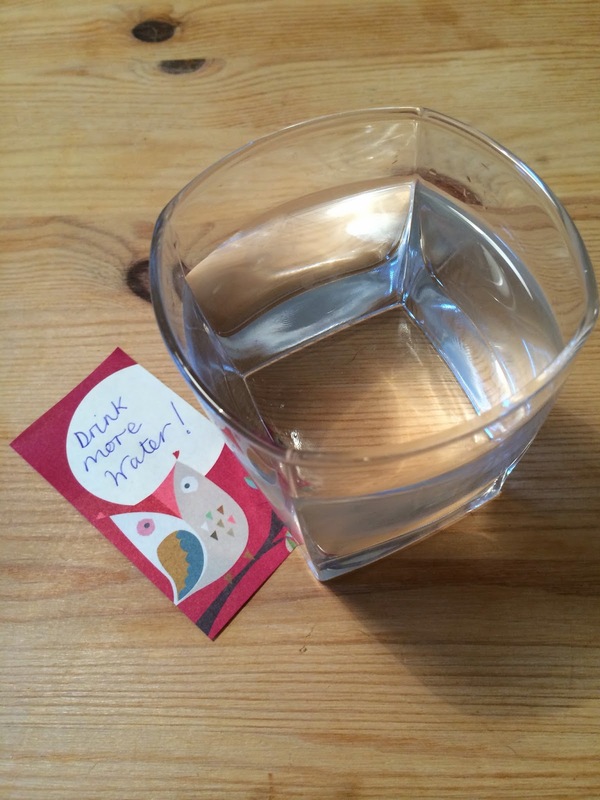 I hate tap water (it makes me gag!) so I always have cold bottled water in the house, which I will drink to my hearts content in 2015 - I'm going to aim for 6-8 glasses a day - a glass with each meal, and a glass in between each meal to start with, and I'll see how I get on. I'll be sure to update you with how I'm finding it, and what improvements I'm noticing as I go along. 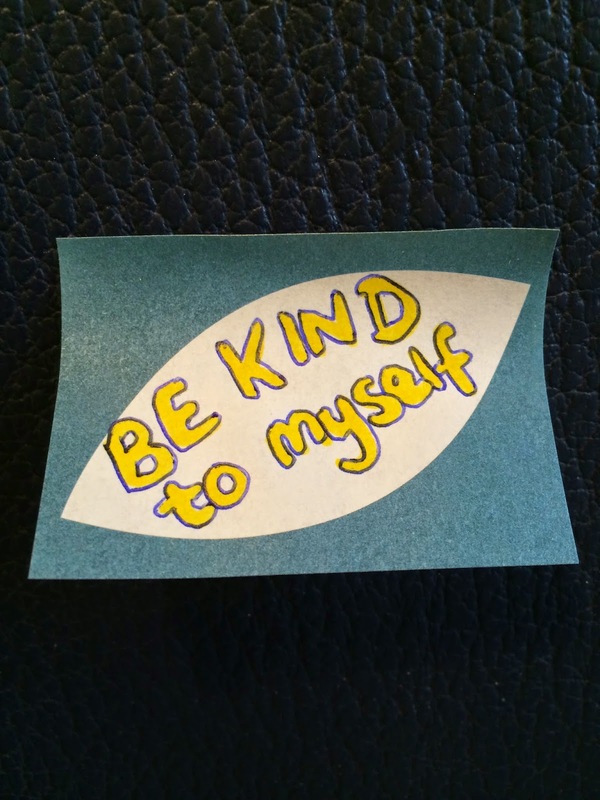 This one is sort of part of the 'being kind to myself' aim, but also a stand alone personal aim for the year. Being an English Literature graduate with a First Class degree under my belt, books and reading are a true passion of mine. However, since having Bert this hobby has well and truly dropped by the wayside, and I've only read a fraction of what I'd usually read since being a mum. I miss it a lot, and when I went away to Cyprus with Liam last summer (without Bert) I read 4 whole books in a week, and reminded myself how much I love to escape into a good book. So this year I pledge to make the effort to get back into reading - I'd love any recommendations from you guys - what should I read this year? 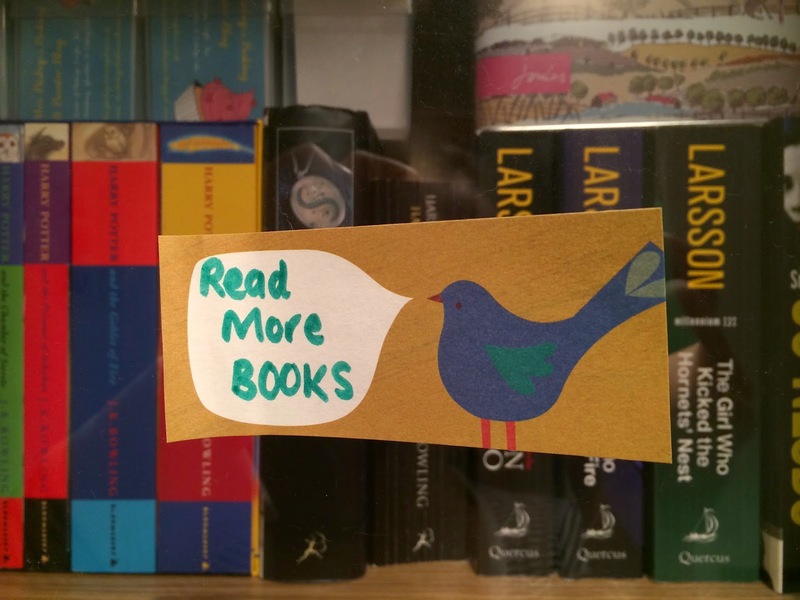 I want to compile a list of 12 books to get through (one a month is realistic for me) in 2015. So, if you have any suggestions please send them over. Book one is 'Before I Go To Sleep' by S J Watson, a recommendation from my husband, and one I'm reading first because I'm desperate to watch the film adaptation on DVD. 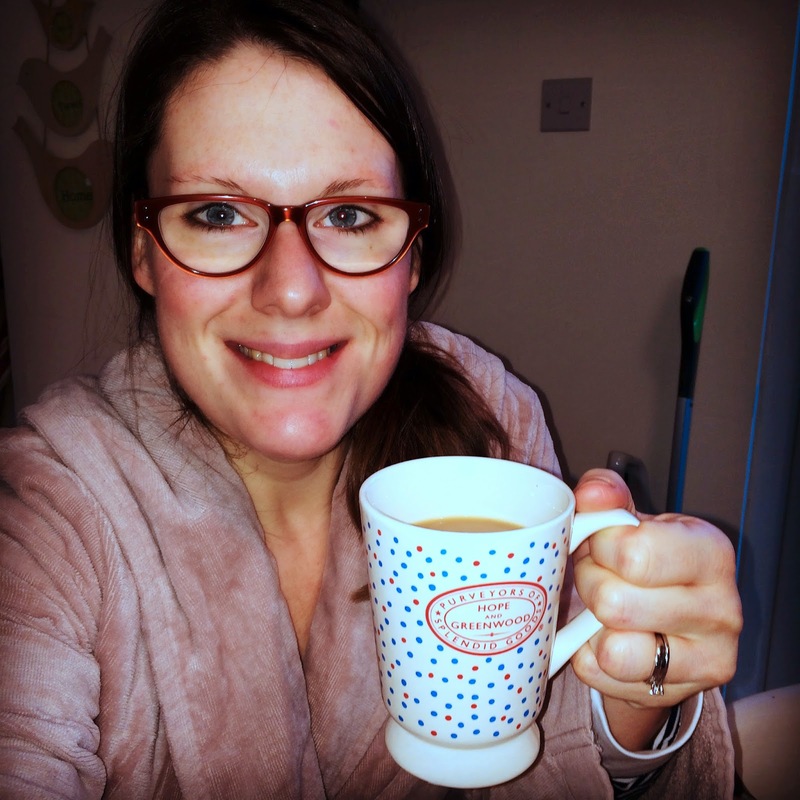 And so, my lovely blog readers, that's it - my aims for the year in a nut shell. They are quite small things, I guess, but they are vitally important to me, and most importantly of all, they are ACHIEVABLE. I absolutely and confidently know I can smash these aims in 2015, and will come out the other side an even happier, healthier person in body and mind. 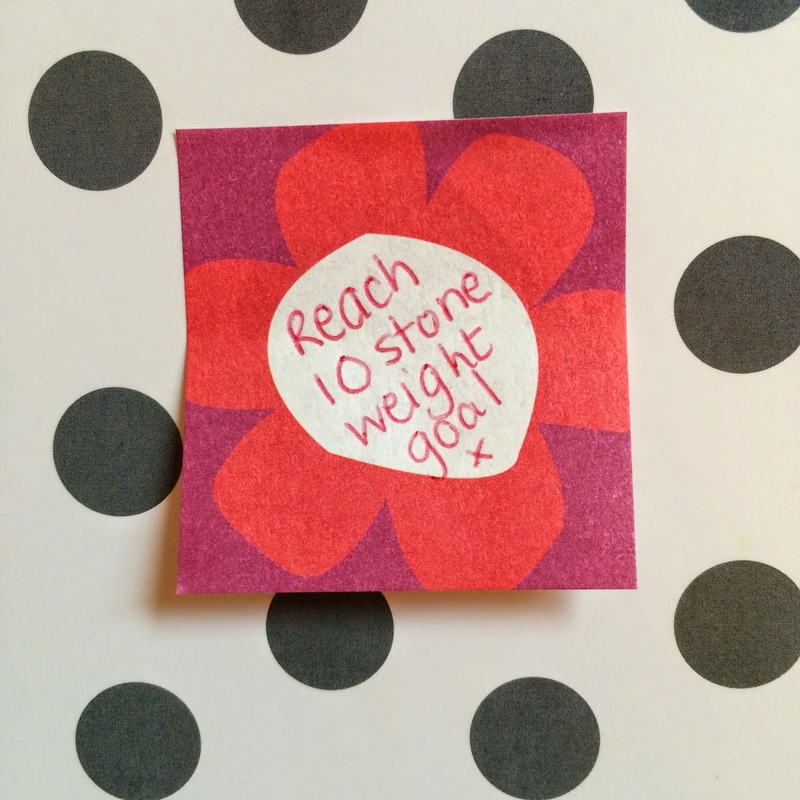 What are your aims for 2015? Do you make resolutions instead? Or do you not believe in making yearly pledges of improvement? I'd love to hear your thoughts, oh and those book recommendations, if you have any! Bye for now you lovely lot - oh, and Happy New Year once again! HAPPY NEW YEAR...2015...Bring it on!